We'll worry about the details of your printing project, so you won't have to. 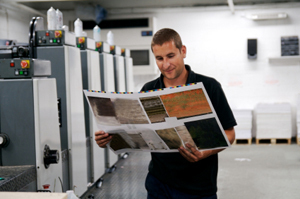 Our traditional printing equipment enable us to produce high-quality projects on time and within budget. A diverse selection of finishing equipment allows us to deliver a larger selection of products and services at reasonable prices. Ecoprint has successfully built our business on the highest quality sheetfed/offset print services, offering superior capabilities and expertise for every project—from a simple two-color newsletter, to complex, multi-color publications. In addition to offering the latest in print technology, Ecoprint is qualified as a G-7 Master Printer to achieve unsurpassed print standards. No matter what type of project you have in mind, Ecoprint has the technology and experience to bring it to life.